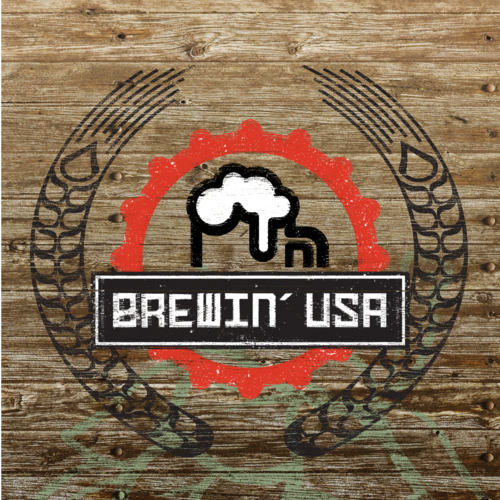 Brewin’ USA is the first game that I’ve played from the Tabletop Deathmatch competition – an independent game design contest sponsored by Cards Against Humanity. It also may be the only game that I’ve reviewed that has an age requirement of 21+. The rules state that this age requirement is due to alcohol promotional product regulations…. However, there isn’t any alcohol in the packaging (at least as far as I can tell), and though it is probably more thematic to consume beer while playing the game, it is not a requirement. Being the maverick that I am, I did play the game with one of my underage boys, and I’m happy to say that he played the game well and will not be scarred for life by the theme! Players try to dominate the craft brew world by scoring the most points. 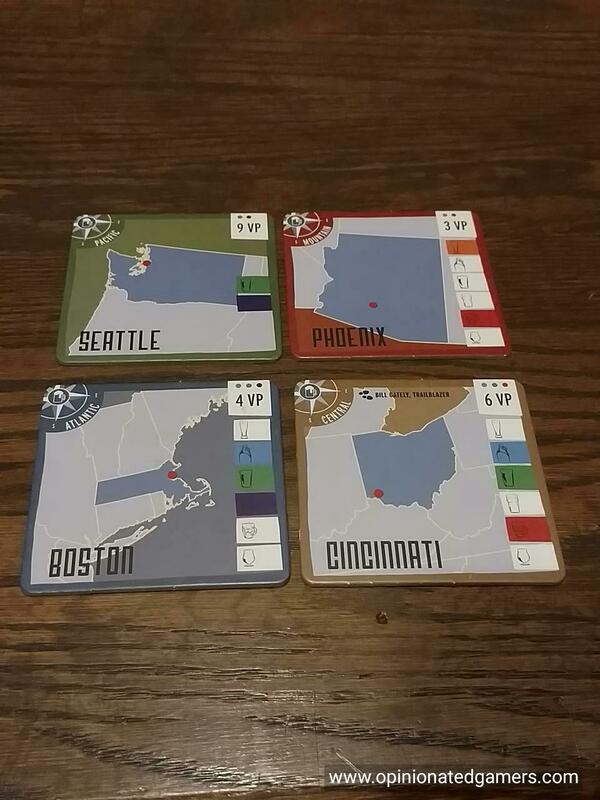 In the game, players make a “map” of the US by playing city tiles to the table; in columns which echo the timelines of the country. The number of tiles is dependent on the number of players in the game. Each tile tells you what region it’s in, how many VPs it is worth, and which types of beers are had there as well as which types are the most popular there. Players are dealt a hand of 5 Beer cards, of which they must discard two. 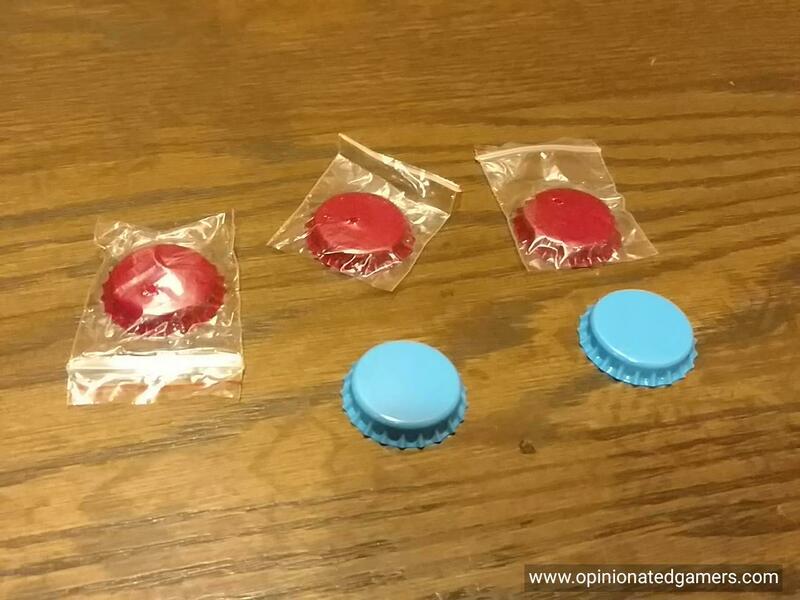 Players take the bottlecaps in their player color as well as uncolored bottlecaps which serve as money while off the board (they will later represent VPs on tiles). The game is played in a number of rounds, each with four phases: Ingredient Auction, Brewing Beer, Brewfest, Accounting. The game continues until one player has brewed 3 Beer cards. In the Ingredient Auction, players try to get the four core ingredients of beer: grain, hops, water, and yeast. Each of these ingredients is found on a different colored card, with varying values of 1-5 on each card. There are also some adjunct ingredients: pumpkin, citrus, berry, bourbon barrel and coffee which can be obtained. The dealer makes one ingredient batch per player in the game – cards are flipped up from the deck until either a type of card is repeated OR a stack has 6 cards in it. Then, a batch is nominated for auction, and players bid on that batch. The highest bidder wins the auction, and the money that he pays is then distributed to Uncontrolled Cities on the map. A player can only win one batch per game round. The player (who is still in the round) to the left of the previous winner designates the new batch to be auctioned and makes the opening bid for it. The last remaining player in the round will win his batch of ingredients at no cost. 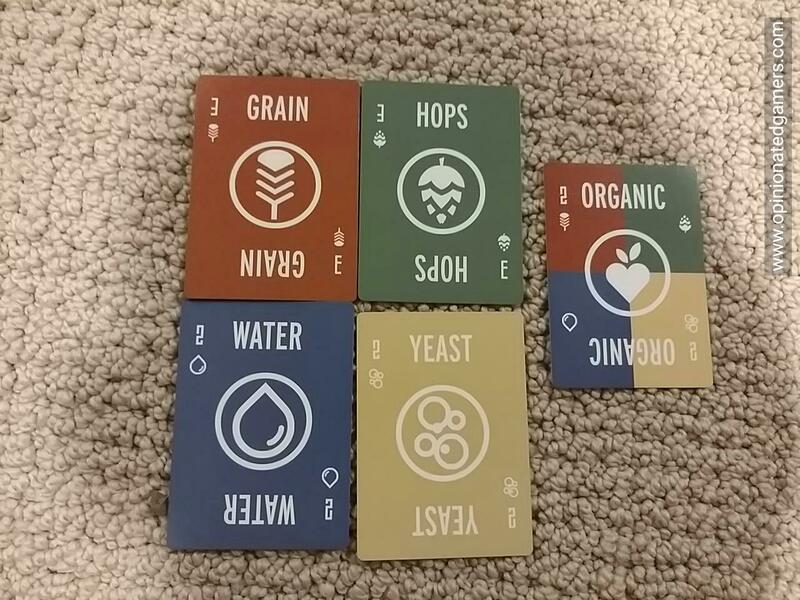 In the Brewing Beer phase, players can try to brew up to two Beer cards. Each of the beer cards has a numerical value for each of the four basic ingredients – the player has to have ingredient cards in each of the colors at least matching the value on the Beer card. Of note, if you used an adjunct ingredient, you may get a special action from that adjunct ingredient card… The played ingredient cards are discarded and then the player can either place this beer on an empty city tile (which takes that type of beer) to take control of that city, or he can place it on an already occupied tile to trigger a Brewfest – this will be resolved in a later phase… Finally, the player who brewed now draws two cards, then discards one to bring his hand back to three cards. The Brewfest phase takes place if there is conflict in one of the cities – that is, there are two or more beers which have been placed on a particular tile. Each of the contestants in the Brewfest now secretly selects three of their Ingredient cards. Then, each contestant selects one card from one opponent and places it on the discard pile. All remaining cards are revealed and the player with the highest total takes control of the city tile. Ties go to the player who was defending the tile. Now, the demand tokens from that tile are split up (remember, these were placed on the uncontrolled tile cards after each auction) – they are split up evenly between the contestants for that tile with any remainder going to the winner. 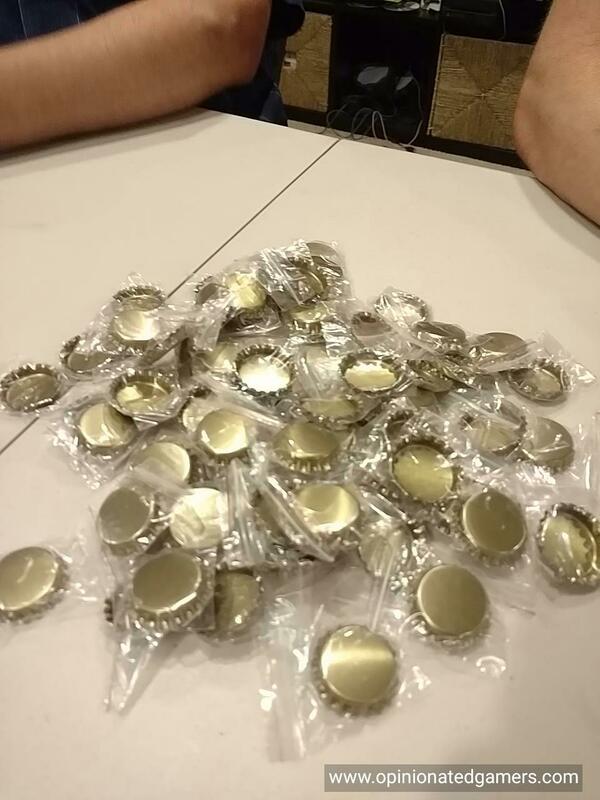 The winner may choose to take the plain bottlecaps into their area to use as money for later auctions or they can leave it on the city tile as Market Demand tokens. Losers take their bottlecaps and convert them into money. They also keep their brewed Beer card in their area. In a later turn, for a cost on 1 money, they can be reintroduced to the game. If there are multiple brewfests, they are done in clockwise order from the dealer. When all of the Brewfests are done, then you move to the Accounting phase. For each controlled city, the player that controls that city can choose to take profits (remove a Market Demand from the tile and place it in their area as money) or to reinvest (take one of their money bottlecaps and place it on the city tile as Market Demand). Some of the city tiles have upkeep bonuses which are triggered if the city is controlled by a favored beer type – this may allow you to earn money from the tile or perhaps take Markey Demand tokens from some of the adjacent tiles. 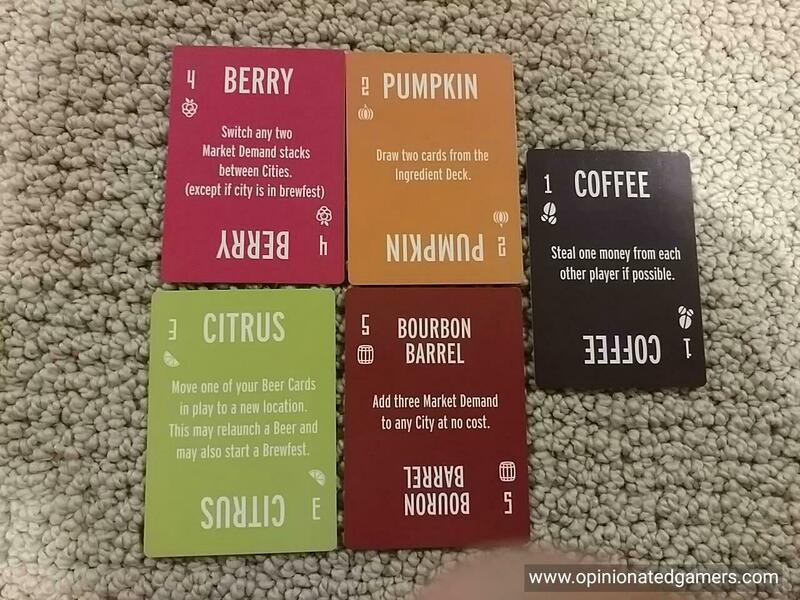 If a player has brewed at least three beer cards, the game ends and you go to final scoring. If not, pass the Ingredient deck to the next player clockwise and play another round. In final scoring, first players can earn Region Bonuses. For each region, you see if there is a player who has control of more cities in that region than any other player. The Region bonus is equal to the total market demand in that region (that is, all plain bottlecaps on all tiles in that region). Then, players score for each of the City tiles that they control. They score a point for each bottle cap on that tile; and then if there is a scoring bonus on the tile, that is also applied. Finally, you get 5VP per brewed Beer card and 1VP per unspent Money. The winner is the player with the most VPs. I’m a fan of some craft beers – a fairly small segment as I do not really enjoy hoppy beers, and the craft breweries really seem to want to pump up the IBU counts of their beers… But whether I like the beers or not, it is definitely clear that craft beer market is growing ever larger. This game taps into this growing interest in super bitter beers and hopes to capture some of the excitement behind them. 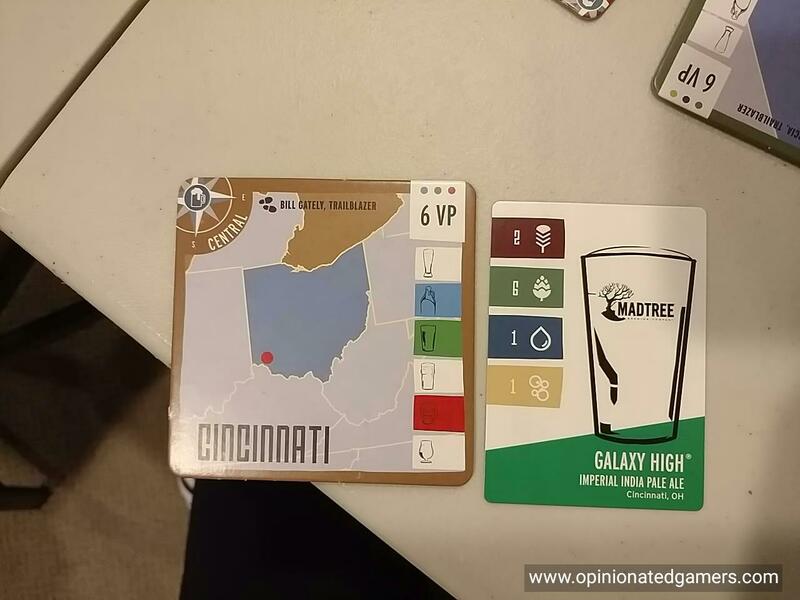 The idea of the game is great, and I love the beer cards. They look cool – each of them has the name of a real brewery and beer on it – and as we were playing the game, we were each recounting stories of how/when we had tried some of the beers pictured on the cards as they came up. The game itself works. The four phases of the game are fairly simple, and the rules make it easy to figure out what to do. There are nice illustrations and lengthy examples throughout the rule book to make sure that you understand how it all fits together. The auctions are perhaps the most important part of the game. In our games, we have only gone five or six rounds, so you don’t get that many chances to add cards to your hand. And, unfortunately, until you are able to get each of the four basic ingredients in your hand, you really can’t do anything at all – because without a brewed beer, you can’t place them on tiles, can’t fight for cities and you can’t collect any bonuses. Thus, you really need to make sure that you get the cards that you need in the auction. The only consolation is that you can have as many cards in your hand as you can buy, so if you can’t brew a beer this turn, you might be able to brew two on your next turn and catch up. 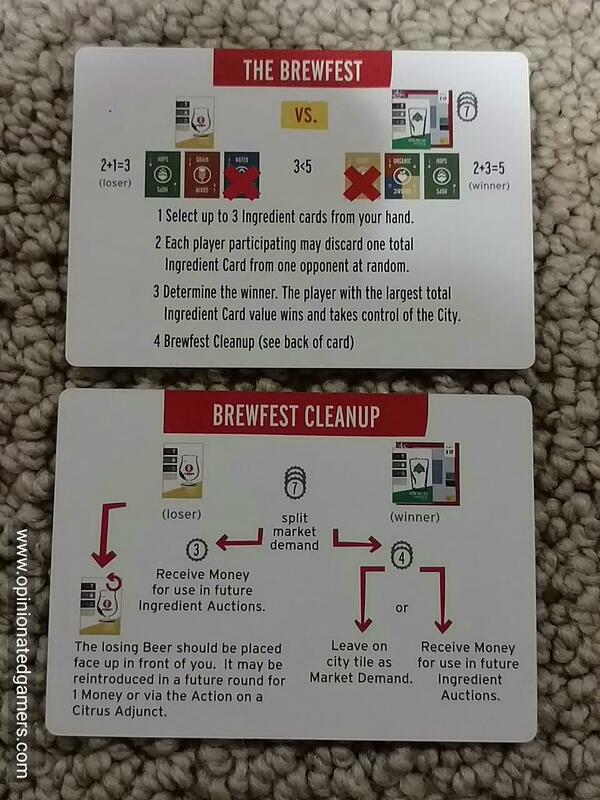 It can be super frustrating when the card you want doesn’t even come up in a particular round – or only comes up in a super small group so that you are able to get a card you need to brew a beer, but you then lose out of the ability to stockpile more extra cards (which can either be used in a later round or used in a Brewfest). But… the game ends when someone has brewed three beer cards, so there really isn’t that much time tempo-wise to be behind. If you stall out in the early rounds, you might not ever catch up. Furthermore, depending on how the rest of the round plays out, the players who were able to brew a beer earlier might even be able to earn enough money (i.e. thru a Brewfest) to ensure that they have as much money as you do in the auctions for the next round; thus, they still might be able to get the best packets of cards in the next round, thus furthering their advantage over you. You might also want to sandbag a bit near the end – as we also found a weird situation that might pop up – when the board is almost full, all of the auction costs are split up amongst the unoccupied remaining cities. We had a time when there was only one, and that tile ended up with 15+ demand marker tokens on it because everything went on that single tile. Only two players were able to brew beer that turn, and they of course had a brewfest over that huge pile of money, and this was a lot of points to split up between them (as one of those beers also triggered that game end). I think the game would feel more complete if you were forced to brew a few more beers – that might give you a chance to feel like you were accomplishing something – as well as to reduce the variance in luck of the auction… But, the game as laid out in the rules already goes 45 minutes or so, and I think that the game length is right for the amount of game you get here. So, it’s probably better just to know that the game arc is very short, and there’s no room for dawdling while playing. While the game has its quirks/issues, we enjoyed our time with it. 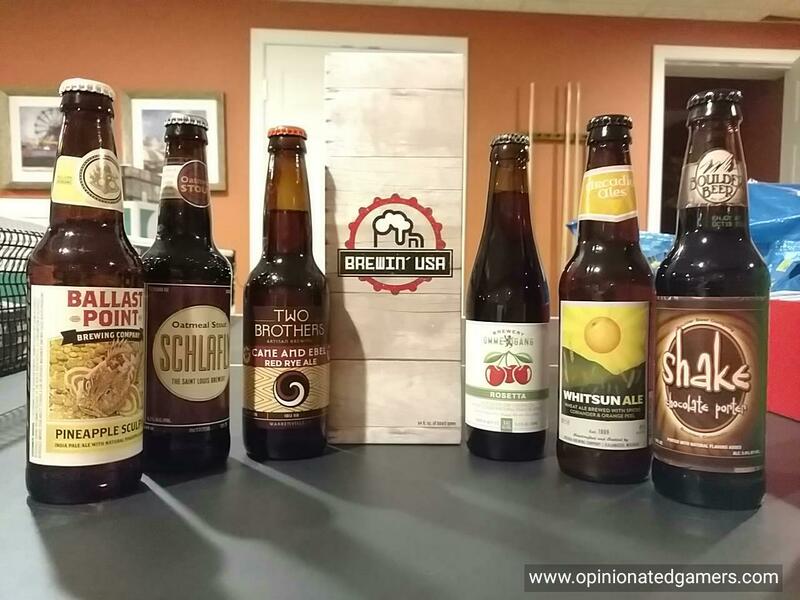 A good evening was had with friends, and we did manage to enjoy a nice selection of craft beers while playing with it. However, like the super bitter double IPAs that I do not care for, the compressed nature of the game and the vagaries of card luck make this something that I would indulge in only occasionally.